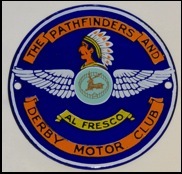 The Pathfinders and Derby Motor Club Limited, affiliated to the ACU through the East Midland Centre, organise 11 motorcycle sporting trials each year, all held at it’s own venue, Clifton Trials Land, Dobbin Horse Lane, near Ashbourne, Derbyshire. Map Reference: SK 175441. Whilst the land does not have a Post Code: DE6 1ND can be used by Sat Nav to locate Dobbin Horse Lane. It is best to access the lane off the A515 Ashbourne / Uttoxeter main road. The events, 8 Closed to Club and 3 Open Status, will cater for all grades of rider and for all classes of machines namely Experts, Intermediates, Novices, Over 40 years of age, Twinshock and Youths. The course usually consists of 10 sections with multiple routes attempted a number of times to suit the day’s conditions and includes a Harder Route suitable for Expert and Intermediate Riders and an Easier Route for all other classes of rider. We have introduced the Fun route for the older rider or those just starting out or wishing for an easier days sport. Club Membership is £5 per calendar year and this can be paid at any trial together with the trials entry fee which includes all the necessary insurance cover for third parties. Riders do need to have a current ACU Trials Registration Number and this can also be arranged at any of the trials.